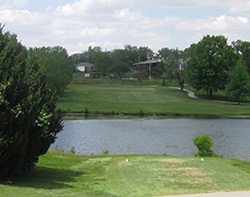 The Leavenworth Golf Club is many things for many people – and it does them all very well. It’s an enjoyable course for a relaxing round of golf. It’s a place for stress-relieving fitness. And it’s a welcoming environment for post-round socializing. It’s also a GreatLife SelectPlus member club. 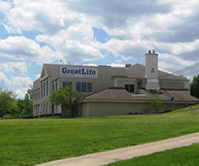 There are twenty-three GreatLife member locations overall, most of which are in the Kansas City area. 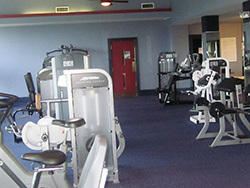 While each includes fitness center access, along with golf, for a single family membership fee, each location also has its own special features. For Suzy Fehseke, a member of the Leavenworth Golf Club since 2010, it’s a golf course that can be played repeatedly without losing interest. Longtime member Chuck Estez likes the challenges that the Leavenworth Golf Club offers. Key among those challenges is water that comes into play on a number of holes. But, as Fehseke pointed out, golfers can learn to avoid them and play away from them. 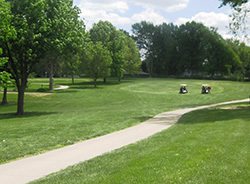 With no long forced carries, the course remains very playable for all skill levels. At only 5,879 yards, the par-70 course is not long, but that adds to its charm, according to those who play it regularly. “People will tell you it’s not the longest course,” Pickrell said. “It’s pretty short and there are very neat holes as far as yardage. The water comes into play and there are doglegs. You have to make some golf shots. You can’t just take out your driver and bomb away.” He went on to point out that with mature trees and an old-style parkland setting, golfers simply can’t spray the ball outside of every fairway and expect to score well. The Leavenworth course has undergone significant changes from the years when it was a private clube known as the Leavenworth Country Club, and it is still in a refurbishing phase. Estez chronicled the history a bit, noting that as a private club, there was significant investment in maintaining the greens and fairways. However, as the membership dwindled, so did that investment and the course suffered as a result. That changed when GreatLife rescued the golf course. Key to turning around the golf course, and its appeal to golfers is a plan that Pickrell has put into place. That plan, after a few years of drought, has management of water resources as a central component. Of course, water management isn’t the only part of his plan. He also recognizes a need to focus on marketing, public relations, and using those disciplines to reach out to the greater community in and around Leavenworth. Establishing win-win relationships like those with his tournament organizers and beneficiaries is just one way Pickrell proves he believes in doing things right. 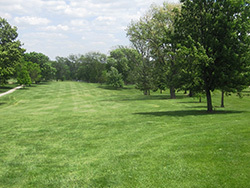 Doing it the right way can make Leavenworth Golf Club a great course again. In the meantime, members enjoy a fun and challenging course, along with the fitness center and swimming pool. And the restaurant is a relaxing feature for most members, too. 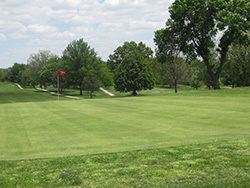 Overall, the Leavenworth Golf Club offers a lot for visitors and prospective members.